Organic Light-Emitting Materials and Devices provides a single source of information covering all aspects of OLEDs, including the systematic investigation of organic light-emitting materials, device physics and engineering, and manufacturing and performance measurement techniques. This Second Edition is a compilation of the advances made in recent years and of the challenges facing the future development of OLED technology. 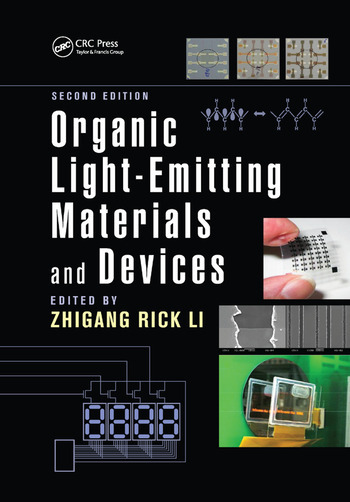 Organic Light-Emitting Materials and Devices, Second Edition offers a comprehensive overview of the OLED field and can serve as a primary reference for those needing additional information in any particular subarea of organic electroluminescence. This book should attract the attention of materials scientists, synthetic chemists, solid-state physicists, and electronic device engineers, as well as industrial managers and patent lawyers engaged in OLED-related business areas. Zhigang Rick Li is a researcher at DuPont Central Research and Development, Wilmington, Delaware, USA. He earned a BS from Beijing Institute of Technology, China, and a Ph.D from the Laboratoire d'Optique Électronique du CNRS/Université Toulouse III - Paul Sabatier, France. Dr. Li is a recipient of the Sino-France Abroad Study Award. For more than 20 years, he has worked in the field of optoelectronics. He is the author or coauthor of more than 70 professional publications and a book chapter, and the editor or coeditor of two books. He is also the organizer/co-organizer/session chair of many national and international conferences, and has given numerous invited talks. He and his colleagues proposed the "nano-Ag colloids assisted tunneling" current conduction model of front-side metallization contact of p- and n-type crystalline silicon solar cells. "This large, tightly written book discusses the physics and chemistry of light-emitting materials, as well as the technology and engineering of the devices they are used in. The chapters on materials chemistry are especially good. There are also historical sketches to introduce each chapter. This up-to-date and authoritative survey of a rapidly changing field is timely and welcome." "This book documents the enormous progress made in this fascinating area. … After a quick look at the table of contents, the preface, and the editors involved, the value and uniqueness of the chapters of this book become clear. …The final chapter gives a very useful summary of the patent positions of the key companies that are involved in the development of organic light-emitting diode (OLED) materials. In conclusion, this book is a very useful and up-to-date collection that reveals the state of the art in OLED materials, devices, and displays. It addresses a broad spectrum of work, from materials synthesis and characterization to display architectures and technology-related issues. This well-prepared and clearly structured book is targeted at both academic and industrial researchers working in the OLED field, but will also be of interest to M.Sc and Ph.D students."